This is a hidden object game with adventure elements, based on the history of the famous mausoleum, built by an Indian Emperor to honour the memory of his wife. 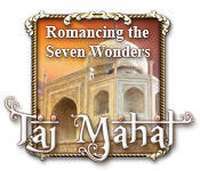 The objective is to explore a section of the Taj Mahal grounds and solve all the puzzles found on the locations. The player moves between the scenes as in most point-and-click adventures, by selecting the exit hotspots usually placed on the edges of the screen, or over obvious places like doors and other openings. Some places have seek-and-find challenges, where the goal is to find and click on all the items listed at the bottom interface. A few of the collected objects are stored in the inventory tray at the bottom to be used later when solving puzzles. The hint button is an urn at the bottom-right corner that shows the position of one of the required objects when selected, but takes some time to recharge after use. The mini-games and puzzles take place on separate screens, where inventory objects have to be dragged and dropped to complete tangram puzzles, jewel decorations on a panel and other similar challenges. In some instances, a mechanism have to be manipulated directly to solve the puzzle.